7 million people live and work within Hong Kong. These 7 million people are squeezed into an area of 31 sq miles, which makes Hong Kong one of the world’s densest cities. In contrary to many other urban plans, Hong Kong has resisted urban sprawl. When cities have typically grown in the past, they tend to increase in size and area. The natural elements in Hong Kong including the mountains and the bay have been physical boundaries of the city, which have contained the city’s footprint. Therefore the only way Hong Kong can handle its population demands is by growing vertically. In order to handle the large population, many systems and networks are in play for transportation, infrastructure, employment, and leisure. Since Hong Kong is operating on such an extreme scale, the focus is on quantity and not necessarily the individual. This is where the question of the individual’s importance to the metropolis becomes a crucial component towards the metropolis as a whole. Cities run on numbers. Numbers are what drive industry, and industry drives growth. “The Culture Identity” states, “Industry is interested in human beings only as its customers and employees and has in fact reduced humanity as a whole, like each of its elements, to this exhaustive formula”. This drive for constantly posting numbers is truly what defines a city, which is enforced by the power of corporations in the urban environment. Each company plastering their name on top of every tower within the city demonstrates this hierarchy. This in return leaves little to no significance for the individual, moral rights, or culture. This formula is exemplified even further during periods of intense growth. For example the industrial revolution in America, lead to economic booms to existent metropolises, and gave birth to new cities at exponential rates. Development was at an all time high, and everything in America became a business opportunity. We are seeing this same behavior in China currently. With industry reporting record numbers, and population at a staggering high, China has been exponentially growing numerically, and in return sacrificing individuality and culture. It is in these times though that we see the human element stripped out of the urban environment. For the same reason that the economic growth of a city is strictly about numbers and not about the individual. Day in and day out, people follow the workweek system, and blend into the collective workforce, in which the urban organism is programmed to respond to these patterns. Hong Kong has urbanistically responded to this system, through its building typologies. As The radical, vertical growth in Hong Kong has littered the urban plan with a series of pencil towers. These slender vertical towers are packed with residents and offices literally stacked one on top of the other. Every window representing a single cell of program designated to the individual. At the base of these towers are series of connections to relocate the individual to its next location either being their residence or office. This linear travel of point A to point B has isolated the individual from its urban context. On the other hand though, there is a more complicated understanding of how the individual is tied into the city. In many cases the predominant driving force of the metropolis is money, but there are also many other elements within the city that belong to the individual. Simmel questions the role of the individual within the larger metropolis for, “It is the function of the metropolis to provide the arena for this struggle and its reconciliation. For the metropolis presents the peculiar conditions which are revealed to us as the opportunities and the stimuli for the development of both these ways of allocating roles to men”. For man to believe he is a completely free being within a city, is in my opinion a mistake, but I would have to argue that there are freedoms within a city in which man can rightfully claim. The individual comes out in the culture of the city, the charm that gives the city its character and personality. If every city ran strictly on numbers then every city would have the same aura, which I would argue is not the current case. On the other hand if Industrialization keeps pushing forward, and we discredit the individual throughout the process, cities may become more uniform with one another and the corporate counterpart may strip the individuality from the city. 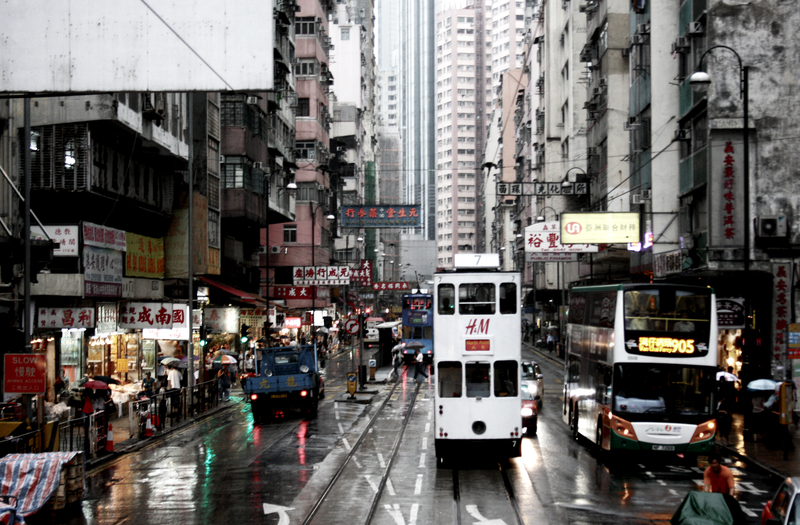 Using Hong Kong as an example, the city’s street life is an important element that represents Hong Kong’s culture. We typically see groupings of street food, vendors, and traditional gift shops parasitically controlling the street territory. This element still exists throughout Hong Kong, but the A to B mentality has started to have serious affects on Street life in the area. Subways taking people off of the street has started to choke these smaller shops, which will deprive Hong Kong of its cultural identity. Personally I think this struggle is represented in Hong Kong’s urban fabric. There is a series of perspectives in which you can view Hong Kong. By starting on top and looking down over the sea of buildings the reading is very uniform and one collective being. Buildings start meshing into one another creating this over whelming collage of windows and structure. As you start to focus though, the details of the city start to reveal themselves. In some instances each unit of the building is carefully articulated, or the street life is vibrant in contrast to what towers above it. This overlaying of individuality on top of the urban fabric starts to demonstrate the role of the individual within the collective whole. From afar we look at Hong Kong as a single entity, but as we take a closer look identity of the city becomes more apparent. It is through these glimpses of individuality that I can argue that the individual is still very prevalent in the urban fabric, and although his role may be small, it still impacts the way people experience and stand out in the urban environment.